“About Us” reflects upon an 11-year career in corporate America, 1,400 miles from home. A career that could be portrayed in a well-written novel; i.e., Opportunity, World-wide Travel, etc…would be chapters of their own. This novel would also need to reflect the yearnings of a woman who, although educated toward and successful in this corporate arena, had a heart that was elsewhere. To be specific, a) she could not stifle her desire to create something that she could call her own and b) family was an important component of her life. However, it was two fateful events that would eventually cause her to realize the urgency for making a career change: 1) The catastrophe of September 11, 2001 reinforced the importance of family and a desire to be closer to home and 2) The elimination of her division and ultimate bankruptcy of her former employer (Enron). These then, served as the impetus for this young woman to ” follow her bliss” and return home to create a business of her own! Oh yes, in 2003 she began using that fine leather briefcase that once carried “important” work to transport an occasional late-night dinner of kolaches. In 2006, enter Hugh Harper as Kristi’s husband and business partner. 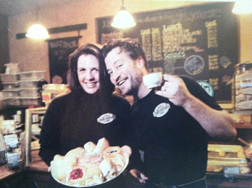 With Kristi’s time now divided between caring for their daughter and maintaining/growing their business, you’ll often times find Hugh front and center at the Cafe. 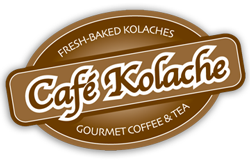 Following his entertainment career in Japan and NYC, Cafe Kolache is now his stage. Stop in to find out which character Hugh is playing today! In summary, Kristi traded in 80 hours/week of corporate work for 80 hours/week as a small business entrepreneur with a home and family to balance. . . and she has never been happier!